Edibility: Not for beginners- but quite tasty. Defining characteristics: Honey colored cap with fine black fibers on the cap (particularly in the center of the cap). A prominent ring high up on the stalk, and if you look closely the gills tend to run down the stalk to the ring (this can be a subtle effect on some specimens). The stalk is tough and often hairy. Generally growing in large to gigantic clusters, at the base of dead or dying trees. Spore print white or pale cream (NOTE- spore color is extremely important in identifying honey mushrooms). Sometimes confused with: Galerina marginata, Pholiota sp., Gymnopilus sp. 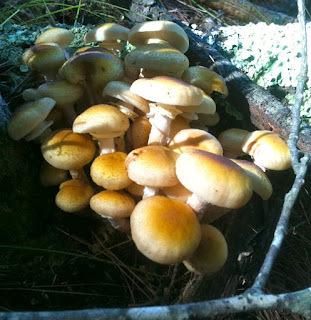 The honey mushroom is a common fall mushroom that can appear in huge quantities. 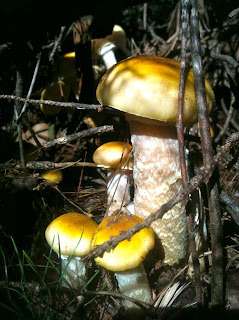 While it is a tasty mushroom (think a milder version of the shitake), there are several dangerous species that look similar and you DONT want to eat. Please be very careful before harvesting honeys and be sure of what you have! It should also be noted that there are many species of honey mushrooms that are all similar, but may vary in one or two of these factors. Be careful and ID before you eat. Is it growing at the base of a dead or dying tree? Does it have a ring near the top of the stalk? Is it growing in a large clump? Is the spore print white? Is the cap honey colored with dark fibers/hairs? If your mushroom meets all the criteria above and matches photos online (a good test is to do a google image search for the species in question and look at a lot of photos to see the range of appearances) then you probably have a honey. Again, if you are in doubt, throw it out. There is a latent bitter/acrid flavor to raw honey mushrooms that slowly develops in your mouth over 20-30 seconds. Cooking well (15 minutes or more) removes this bitter flavor and makes it more palatable and safe. It is reported that a small percentage of people are also sensitive to the honey mushroom, so eat a small amount the first time. The honey mushroom has the impressive distinction of being named the largest single organism in the world (a single specimen in Oregon covers 2,000 acres). It is a parasitic mushroom that spreads underground via its mycelium and rhizomorphs, attacking and killing weak trees. The mushroom may continue to fruit for many years in the same spot, continuing to feed on the root mass even after the tree has died and fallen. One upshot of this is that if you find one tree with honeys, you may well find more in the neighborhood. For more information check out the following resources: Wildman Steve Brill, Wikipedia, or Mushroom Expert. dark fibers on the center of the cap). ANOTHER one that I'm gonna be looking for. Great little article on what to watch for in order to correctly id a bunch of honey. The reason I want to find these is that THIS is the only mushroom BESIDES hens that my family ever picked...and honestly they tasted A TON better than the hens....and I love hens. My uncle, who lives in Providence, used to pick em in RI and called them "signorini" which means young ladies. Im wondering if THESE are what he was picking.